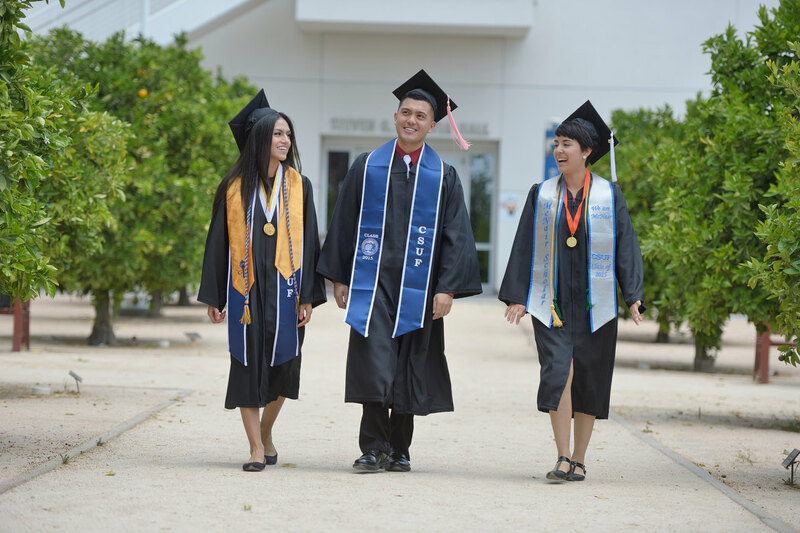 Cal State Fullerton graduates Karla Lopez, left, Christian Bana, center, and Angelica Ruiz on campus on Monday. Karla Lopez is a 26-year-old biology undergraduate student who is on her way to becoming a health specialist. She hopes to be a physician’s assistant in the future. Christian Bana is a music student. When filling out his CSUF application, he accidentally checked the “music” box instead of the “kinesiology” box. He decided to stick with music and will be teaching next year. Angelica Ruiz is an undergraduate health science and women and gender studies graduate who conducted a research project on the affordability, access and the quality of fruit and vegetables in the Santa Ana community. This entry was posted in Local News on May 4, 2015 by Jeff Gritchen.